1. Clear the Cobwebs: We all have mental cobwebs after a long winter. The first thing to do is to clear them out. You can do this by taking a personal day for re-creation. This can be as simple as sitting outside and reading a special book or as elaborate as a day at the spa. The choice is up to you. There are many at-home' spa kits available to give yourself a day of pampering. Arrange with a friend to spend a spa day together. We all lead such busy lives that a day with a friend is a rare treat. Whatever you choose to do, take the time to clear out the mental cobwebs and get a fresh outlook for Spring. 2. Switch Out: Do you still have winter accessories out and about? Do you have winter accessories that you didn't put out? Before you trade and bring out the warm weather accessories, take time to pack up the items you didn't use for winter and set them aside for donation. You have a good idea of what you actually use, so donating the excess is the perfect thing to do. As you put your spring/summer accessories out, be aware of what you don't put out as it may be something you are ready to donate right away. 3. Lighten Up: Clutter can't be organized, so declutter, declutter, declutter. When your spaces are filled with things, your perception is that rooms are closing in on you. When we lighten up our spaces, they definitely feel brighter. So, pick a room to work on and lighten it up. The items that you choose to declutter can be donated to a charity or sold at a yard sale! 4. Spring Forward: With the daylight lasting later into the evening, now is a good time to re-organize your work-out routines. It's likely that through the winter you had your workouts restricted to indoors. With the arrival of longer days, it's possible also to shift the time of day you exercise. If mornings are hard for you to fit in a workout, an after-work or after-dinner walk is now a real possibility. Now is the time to change things up a bit and change your schedule with some new scenery and introduce a fresh state of mind for your workouts. 5. Cooking Confusion: Are your recipes and cookbooks in a state of disarray? Now is a good time to breathe new life into your cooking. The first thing to do is to go through your cookbooks and loose recipes and eliminate those you haven't used and don't plan on using. Be realistic about what you will actually try to make. Once you have eliminated those you don't want, make a plan to try a new recipe each week! Also, if you try a recipe and no one likes it--toss it! Look through your cookbooks with a critical eye to which ones you actually use. There are so many recipes available on the Internet now, that it almost makes it unnecessary to own cookbooks at all! 6. Trash Tattered Towels: Have your bath towels seen better days? Take time now to do a bit of Spring organizing and sorting of your towels. Those that are showing their age but are still serviceable can be donated to a local animal shelter like the SPCA. They will appreciate your donation. Take inventory what remains. Replace worn ones with fluffy white towels. These will give your bathroom a fresh spa-like look and feel. 7. Outdoor Organizing: With warmer weather, many of us are turning our thoughts to the outside of our homes. Spring is a perfect time to plan your garden and yard care tasks. It's also a great time to take a look at the curb appeal of your home. Did the cement or driveway crack over the winter? Does your house need a new coat of paint? Organize your gardening tasks and cleanup tasks. Add at least one item to your calendar every weekend. Now is also a great time to order your seeds and plants for the garden you have planned. That should give you plenty of time to get your seeds started and ready to plant since all danger of frost is now past. 8. Organize Your Refrigerator: I always advise to do this before Thanksgiving but this is also a good time of year to organize the fridge. Organize your refrigerator for more room and greater efficiency. You can use small baskets or bins to group like items together. [CLEVER CONTAINER has a great line of bin organizers for your fridge and pantry. Check them out right on this website! Just look for the CLEVER CONTAINER tab on the home page. They are on Page 6 of the catalog.] Use them to put salad dressings in one basket, condiments in another, jams and jellies in another and so on. You can also put in a basket for fruit and another for vegetables. Not only does this free up space in your fridge, but you will also have things organized in such a way that makes it easier to find everything. Being able to find what we need in the refrigerator can be a welcome change! 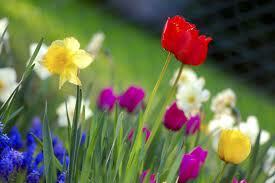 Get Spring off to a good start but using the tips above and enjoy the season of new beginnings! If you have any additional tips, we would love to hear from you. In the early morning hours of this coming Sunday, most of us in the US will "Spring Forward" an hour to begin Daylight Savings Time. We do lose an hour of sleep and tend to feel it's affects for several days thereafter, but it's also a great time to take on a few quick Spring chores. Check your smoke alarms and carbon monoxide detectors. In addidtion to replacing the batteries and testing your alarms, be sure to also check the units' expiration dates. For your family's safety, you want to be sure all of these devices are functioning at their best. If you can't find expiration dates on your alarms and detectors, replace the units every 10 years. Turn on the water. If you shut off the water to all of your exterior water faucets in the Fall, now is the time to turn those faucets back on for Spring. If you might run the risk of another hard freeze this year (doubtful where I live), you might want to wait a little bit longer. If you need to bring out water hoses, now is the time to pull them out of storage. Although we lose an hour of sleep on Sunday, I love that we get an extra hour of daylight at the end of the day! What other chores do you like to do when the clocks spring forward? I would love to hear your suggestions. In the meantime, Happy Daylight Savings Time!